Garage doors can be categorized according to springs that they use. There are garage door torsion springs, and extension springs. Torsion springs are located above the garage door. When there is no space for torsion springs, extension springs are used instead, and these are located attached to the side of the doors. When repairing a garage door, springs are the most dangerous parts to replace. 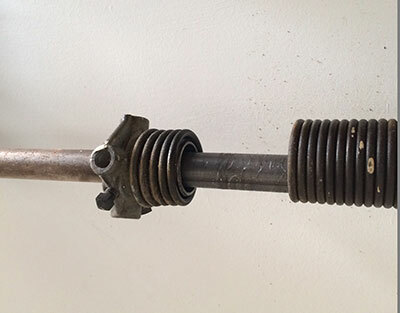 When replacing torsion springs, it is highly recommended that it be left to experts and professionals. When they break during replacement, it can cause undue damage and injuries. Accidents have been known to happen, even with professionals doing the replacement. Among other things, spring replacement also requires balancing afterwards. This is another activity that requires training and understanding of door opener operations. A door is not raised and lowered by the power of the motor alone. The motor controls the movement, but the power is from the spring. The spring acts like an elevator's counterweight. The door is neutrally balanced, and stays in place. Only a slight force is needed to raise or lower it. A properly balanced spring ensures that it can be opened or closed manually almost without any effort. Our staff at “Garage Door Repair in Highland” understands the importance of door springs. We are trained in repairing and replacing springs from the major manufacturers and their various models. We have the parts in store as part of our inventory. Do-it-yourselfers would have to order their parts online, and delivered to their doorstep. We bring the parts with us when you give us a call to replace your springs. When repairing your door springs, we know to be careful and take the necessary precautions. Our experience with previous installation and repairs has made this part of our nature. 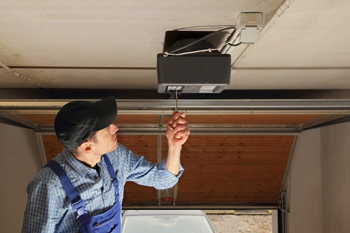 Garage Door Repair in Highland understands the problems and the troubles and we make sure that the possibility of accidents happening is at a minimum. When you have problems with your garage door, give us call. You can tell us the problem and we will be there at your home or office prepared and bringing with us the required spare parts.